Teaching is not a competition against your peers or other schools. Open your doors, share your ideas, ask for help, but most importantly be willing to learn. There is a wealth of ideas to be gained from building a PLN. Look to the Internet and social media for inspiration. It’s hard to remain passionate about teaching when you keep your ideas to yourself. By collaborating your passion, your excitement for teaching increases because you have the energy and support of those you surround yourself with. The most important thing a student can gain from their education is the ability to think critically. It is a great shift from “I’ll do what I am told,” to “I’ll do what I think.” As educators we sometimes fear getting students to that point, but it is critical if we are to have a democratic society of thinkers. I do not feel that technology is the only way students can gain critical thinking skills, however tech gives us access to a plethora of tools that can aid a student and teacher in practicing critical thinking skills. Children can interact with technology however they want to. That in itself is a great power that lends to critical thinking. Technology opens metaphorical doors to places and people that students would otherwise not have access to. Through the Internet students can access articles to ponder, opinions to consider, and ideas they didn’t even know existed. The knowledge and perspective I have gained through social media and online articles has opened my own ideals to new possibilities. I used to make fun of people “tweeting” and now I look to Twitter as a springboard of new ideology. I have hashed out many of my perspectives via Twitter and in doing so, in debating with the likes of Lisa Neilson and Joe Bower, I have altered my education pedagogy. I probably never would have joined Twitter if it weren’t for Professor Jim Pinkard at APU. 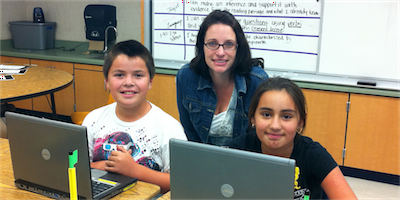 How is data collection and analysis best used to support student learning? What types of data collection do you find most useful from a teaching perspective? Data in some places is a foul word and in others the mantra. Data can tell you your strengths and weaknesses in measurable areas. At the same time it only can tell you the statistics and not the reasons why. When I first learned the powerful ways that data can guide instruction, I was hooked. For so long, especially teaching first grade, my measures of success were based on observation. Many of my students’ learning gaps were missed because they were decent workers that seemed to understand what we were learning in the moment. But when data informed me otherwise it was like a slap of reality. When I moved into teaching 4th grade, I depended on data to tell me if I was being an effective teacher because I didn’t know the curriculum like the back of my hand like my peers. I couldn’t just rely on the motivation of students to tell me. My perspective coming from a data manager side allowed me to see connections between essential standards and non-essentials. It seems counter-intuitive, but by focusing on the essentials I was able to free up time in my day for innovation. It let me narrow in on my focus to get all students successful with the “non-negotiable” standards expected of teachers so then creativity could happen. When we teach, “a mile wide and an inch deep,” we are doing our students a disservice because we have spread our teaching and their efforts too thin. When we teach, “a mile deep and an inch wide,” We are able to teach content to it’s fullest, at all the levels of thinking. When I collect data I look first at the essential standards. They are the big coverall standards that students must have in order to be successful in the years to come. My team and I create or find a formative assessment that tells me what the kids know and have yet to learn for that standard. Ideally, the tests have questions that will tell me what prior knowledge the students have and which pieces within the standards they are strong in. This allows us to plan our instruction. Very rarely do we plan instruction without some form of assessment (informal or formal) guiding us. We never teach something blindly just because the curriculum or standards tell us to. We teach what our students need. We teach using the best practices we know, all the while collaborating and sharing the experience. When we feel the kids are ready (based on informal observations), we give a summative assessment. If the kids demonstrate that mastery wasn’t met, that summative assessment goes back to being called a formative assessment. We labor over the results to determine what parts of our teaching was successful and which parts need to be reexamined and changed. We don’t keep teaching that one standard until it is mastered but we include it in our daily routines and find ways to integrate it until the kids hit a developmental milestone. The next assessment has questions for the new and the old material that the students have yet to pass. The scores are not combined but rather each standard gets its own score. It’s a tedious process and I am only in the second year of it. We have to thoroughly examine what we have done as teachers and what each and every student struggles with. We never just write down test scores and close the grade book. It takes hours of reflection in order to be successful. Data is only valuable if you use it to drive changes in instruction. In a recent blog post you talked about standardized skills assessment and differentiated learning. How do you assess less tangible qualities (teamwork, communication, creativity) and how do you share that information with families? I enjoy the less tangible assessments. I think of it as writing letters of recommendation for each of my students. I ask myself, “what qualities do I see in this child?” When I think of each student, there is always a multitude of positive attributes for each. There are students that will stretch my thinking and force me to admit that their perceived flaws are actually my own. The talkative one is that way because she needs affirmations, the sullen one is that way because he needs time to process; all of these are my issues because I waited too long to realize them. The best way to assess collaboration, communication, creativity, and passion is to walk the room and take part in their discussions. Provide opportunity for the kids to work in teams and witness the way they process the problems. Answer questions with questions and see what they think. Our school only schedules twenty minute conferences for parents once a year. I intentionally space my conferences out further than the requirement because I know that I like to share stories about each child. Academically, a student may be struggling, but that is not the only thing a parent comes to hear. Parents need to know that the child they entrust in my care for six hours a day has a connection to me; that I notice them and know them. Despite a poor performance on a test their child demonstrates effort or passion at other times. Social Media is the first place I turn when needing ideas or learning. I ask my PLN, I look at others questions, I read their blogs. There have been many times that I discover ideas that are new to me that I didn’t even know I was looking for. I never would have considered flipping my social studies content if it weren’t for perusing blogs. I never would have discovered Kidblogs1 as a safe place for my students to write collaboratively. The best part of my job(s) is having the opportunity to inspire children. I love taking the intentional non learner, the apathetic student that wants nothing to do with school, and inspiring them to find their passion. For the students that already love school, I guide them to find their weaknesses and help them to understand them better. The best part of my job may sound cliche, but it’s the truth. I grew up with a high respect for education. My grandfather, Jerry Dann was a beloved principal and football coach in a small town. He was married to the school librarian and they had ten children. He passed when I was three but I grew up hearing stories not only from my family but complete strangers about how he inspired them. To this day 28 years after his passing, I have coworkers that discover I am his granddaughter then look at me with awe and share their stories of how he change their life. He knew how to speak to people so that they listened and felt heard all in the same moment. When it came time to choose a career out of high school I knew I was meant to be a multiple subject teacher because I could never choose just one subject to study or teach. You could never ask me growing up what my favorite subject was because I would list them all and why I loved them. Children always flocked to me at gatherings and I enjoyed entertaining them. My whole life I had heard, “what a great teacher you’ll make someday.” It stuck with me and to this day children still flock to me at family events. I attended Ventura College for my AA in Liberal Studies. Despite being accepted into my number one choice for school I choose to defer my enrollment to stay close to be with my fiance and family. I transferred to Cal State Northridge while it was on the local Cal State Channel Islands campus as it was just starting. It was a former mental hospital that at the time was very eerie. Night classes were my least favorite at that time. After one year at CSUCI at CSUN my husband was accepted to my original school of choice, California Polytechnic State University and I was finally at the school I’d dreamed about going to since a child. The school imbedded technology, science, and math in as many courses as they could. This is where I learned how instrumental technology was going to be in my teaching. There I finished my Bachelors of Science in Liberal Studies and my Multiple Subjects Teaching Credential. I taught locally for two years as a Literacy Support teacher. This gave me time to develop as a teacher and gave me opportunities to collaborate with a diverse population of teachers. I discovered how to help non-learners learn. Most of the time all they needed was the right motivation and a personal connection with me. When my husband finished his architectural degree we were able to move home to Ventura. I put in three applications to three districts at a time when pink slips were being handed out. I thought the odds were against me, however I was granted three interviews and offered three jobs. I accepted my first classroom assignment in the same district my grandfather had worked. In fact my first room was my 4th grade classroom. My principal was my kindergarten through second grade teacher. I felt I had been called home for a reason. I taught a K/1 class my first year. The following year I looped with my kindergarteners and became their first grade teacher. I had the privilege of teaching first grade for the next 4 years. In addition to my teaching duties I was on the Technology Committee for 4 years. This led to a position as Technology Lead teacher and Data Manager in 2009. These positions gave me the opportunity to bring technology to my staff and teach them how to use it. I also managed our data program by creating, scheduling, scanning, and dis-aggregating data for our teachers to guide their teaching. With my 5th year of teaching coming to an end I realized I wanted to develop more of my professional portfolio so I entered the Masters of Education in Technology and Learning program through Azusa Pacific University. At this same time my principal had a need for me to move into a new grade level team. I eagerly joined a wonderful 4th grade teaching team. I am in the final week of my masters program and in the mist of my second year of teaching 4th grade. APU has a thorough program. I learned everything from pedagogy to website design (I can actually do HTML with Dreamweaver!). My classes taught both technologies but technology with integration. Every step of integrating technology comes from a purpose and a plan while educating. I enjoy every moment of it. At the same time I look forward to the next steps in my career. Hi. My teacher is great.